Prev 3Doodler Start: Should You Buy It? A Review from a Crafty Mom. Next Snow Day Fun Cupcakes for a Winter-Themed Party (or any day)! 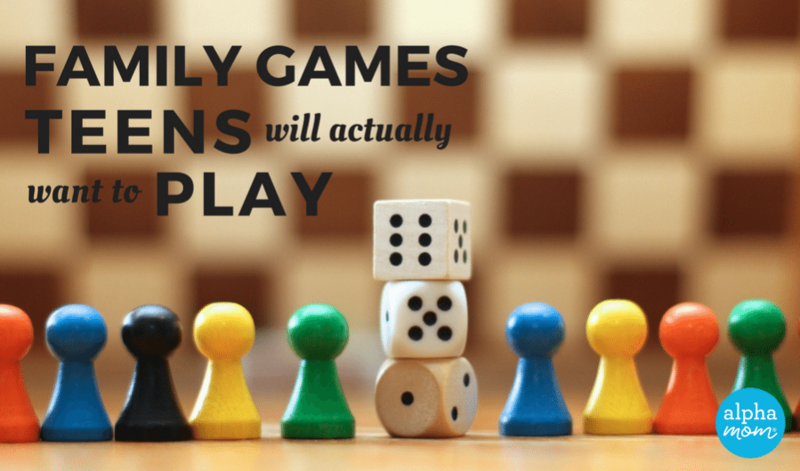 Ever since my boys were old enough to sit still and pay attention, we’ve regularly had “Family Game Night” at our house. We usually pick whatever games make sense for their ages, however, we’ve reached a little bit of a bump in the road now that they’re 13 and 15. There are a ton of options for the younger crowd, and many for the older crowd, but finding something in the middle of too babyish and too mature isn’t easy. My (young) teenage sons and husband loved this game and played it for hours. They loved the irreverent tone, as well as the challenges. (Personally, I was confused and tried to die as soon as possible in the game.) 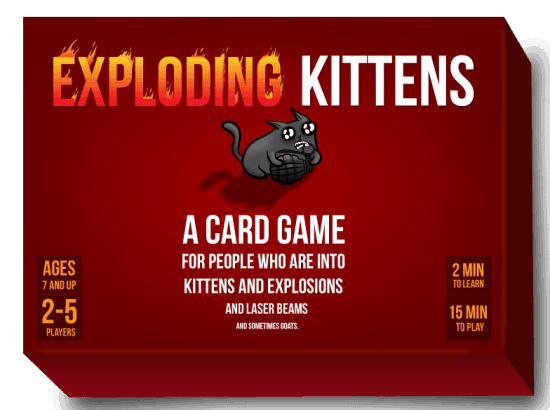 Another bonus is that it’s a pack of cards, so very portable. The same creators just released a new game, Bears Vs. Babies, that looks AWESOME. Remember the trivia series “You Don’t Know Jack” from the 90s? 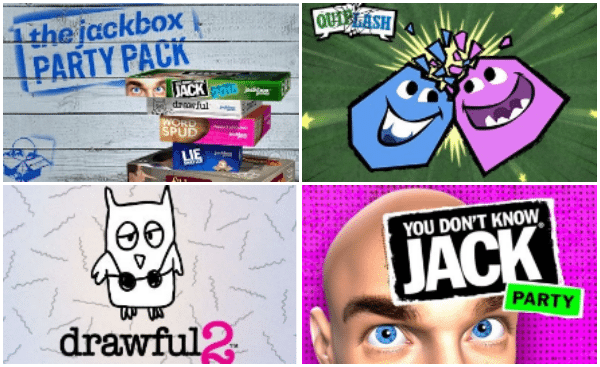 Its creators now bring you Jackbox Games, featuring a host of funny, fast, and interactive party games available for download as digital games. We bought Jackbox Party Pack 1 and Jackbox Party Pack 2, which are game bundles that include five games each, via our XBOX. You can also download these games onto your computer (PC or Mac), PS4, Apple devices (from the App Store) or stream via your Amazon Fire TV or Apple TV. Once the games are downloaded, you click on the one you want to play, then everyone goes to Jackbox.tv on their smartphones/tablets and starts. It’s really easy to do. Some of the games are for 2-4 players, but some can be 100+ players. Way more than you probably need, but maybe your family is bigger than mine. We played all of the games in the packs, and landed on a few favorite games, specifically Quiplash. In Quiplash, each player gets a prompt on their phone, like “The worst thing about having a mustache is _____” then you type in your answer. Once all of the answers are in, they appear on the TV and you vote for your favorites. We’ve had some hilarious answers. (Note: But make sure you have it set on “Family” mode or you’ll get a few questions you’d prefer your 13-year-old not answer.) My boys LOVE this game and literally beg to play it every night. Instead of NBA2K. If you have a teenage boy, you’ll know how huge that is. You can also download and buy Quiplash standalone from the Jackbox Party Pack. We also loved the Drawful game where you get a prompt on your phone, and draw something on your phone (or tablet) based on it. Then the drawings show up on the TV (or computer) and everyone types in their answer about what the drawing is supposed to be. Then you all see the suggestions posted and you vote on the one you think is the real answer. Obviously this leads to even more hilarity. And it also shows you who in your family is unable to draw a complete circle (me). Like Quiplash, Drawful can also be downloaded and purchased as a standalone game. Another favorite game from the Jackbox Party Pack is the old school version of the You Don’t Know Jack trivia game that’s very current and fun. The questions tend to be pop culture, but there is history and other basic trivia, too. It’s all presented in a really entertaining way with “Jack” saying funny things, cool graphics and sound effects, and a fast moving format to the game. One of the questions we had was something about “Did Justin Bieber Do This Stupid Thing or Not?” (Which was tougher than you can imagine. He’s done a lot of stupid things.) This, too, can be purchased standalone rather than in the bundle. Highly recommend, especially if your teens love fast, irreverent humor. As far as what/how much to buy, we bought Jackbox Party Pack 1, which has Drawful, You Don’t Know Jack and three other games, and Party Pack 2, which has Quiplash and four other games. Each party pack was $24.99. We didn’t necessarily love all of the other games in the packs, but the Party Packs are still the most cost effective choice because the individual games are $9.99 each. This (version of the game at least) was way too basic for my kids. We had fun, but it’s similar to so many other games we’ve played, and the dry erasing starts to get old after a few rounds. Plus, the questions weren’t that interesting or challenging to them. 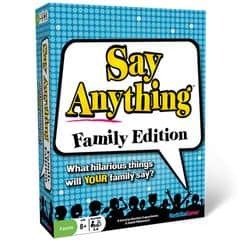 I have heard from Isabel that her family (she has a 13 year old son) really enjoyed playing the regular (non-Family Edition) version of this game after Thanksgiving dinner with her large group; the regular is loaded with awards, so perhaps that version is more fun and interesting. This was really simplistic for my teens and not too fast moving. Plus there’s no scoring to this game. The winner is “everyone who had fun!” My teenagers thought that was completely lame because why play a game if there’s no winner? We picked the “family pack” to play because it was for 4-6 players but that may have been a mistake. 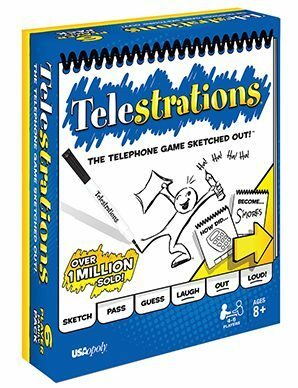 We probably should have tried the Telestrations Original version (which is award-winning) and for ages 12+ and is also for groups sized 4-8 players. We’ll give it another chance in hope that it will be more age-appropriate. Then there’s always our old standby for Family Game Night, card games. Not too many bells and whistles with cards, but you can play them anywhere and a pack of can be bought for under a dollar. Of course, no matter what game you play, the important thing is that you’re all together. And when you have teenagers who don’t always want to hang out with their parents, that makes you the winner.